Posted August 11, 2012, in Events. Considering graduate school at Rutgers-Camden? Visit us at the Graduate and Professional School Expo on Saturday, October 6 from 10 a.m. to 2 p.m. at the Cook Campus Center, Cook Campus to find out about the MA in criminal justice on the Camden Campus. 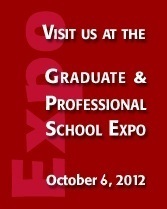 For more information and to register to attend the Expo, visit https://gradstudy.rutgers.edu/. Page last updated by Sociology, Anthropology & Criminal Justice at 4:00 pm August 8, 2017 . This page was printed from http://sociology.camden.rutgers.edu/2012/08/11/graduate-professional-school-expo/ at 10:40 PM Thursday, April 25, 2019.